Yet another place for Templar mysteries and lost relics. Local author and researcher Graham Phillips has researched the area extensively coming through with some interesting observations…I have left some links to his research in the links section of TM…..Mainly consisting of presentations uploaded on to You tube and Graham’s main web site. Worth a look if you are interested in researching the area further. 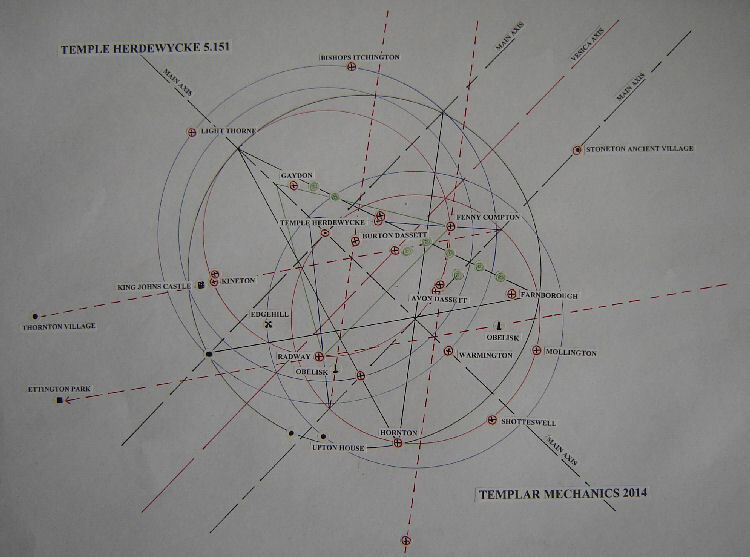 The Temple Herdewycke geometry however is all from the TM stable. Some of the points/areas featured in Graham’s presentations feature in the landscape geometry. I leave it to the viewer to decide if that is coincidence, if there is such a thing. The TM quest has never been for lost treasure, although I do believe, based on past grid experience, that anything found in the future may very well have an association/ relationship to the geometrics….If for no other reason than to knock home the revelation that the spiritual realms control all manifestations in the physical and what people build /bury and the item(s) placement /position is never random or by chance….Fate is full of irony. 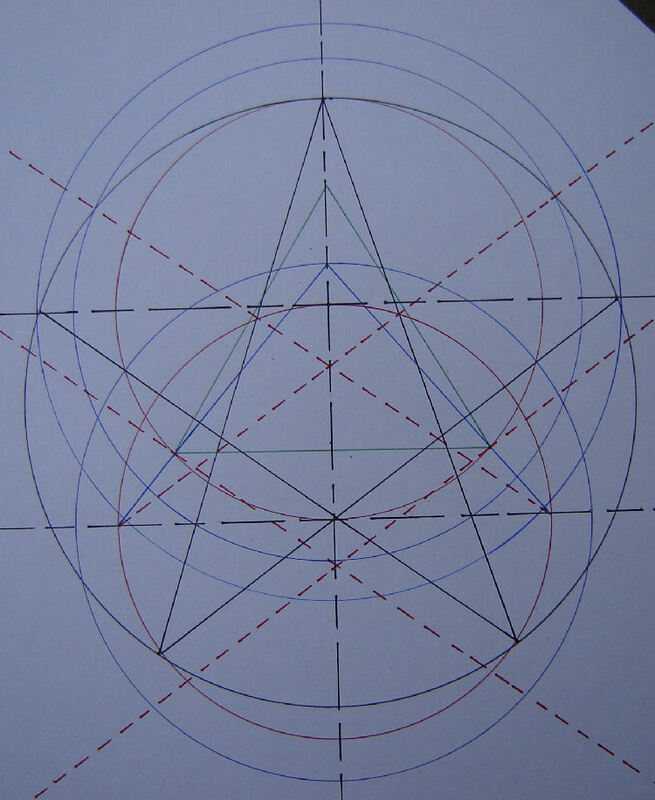 2 5.151 circles underpin the whole grid, marked in red…Formed in a Vesica Piscis arrangement . The 51.51 triangle is there again giving us also the relative Earth /moon circle..all marked in blue. The green triangle is an equilateral triangle. The central axis of the Vesica passes through Burton Dasset church, an important point in the local study. 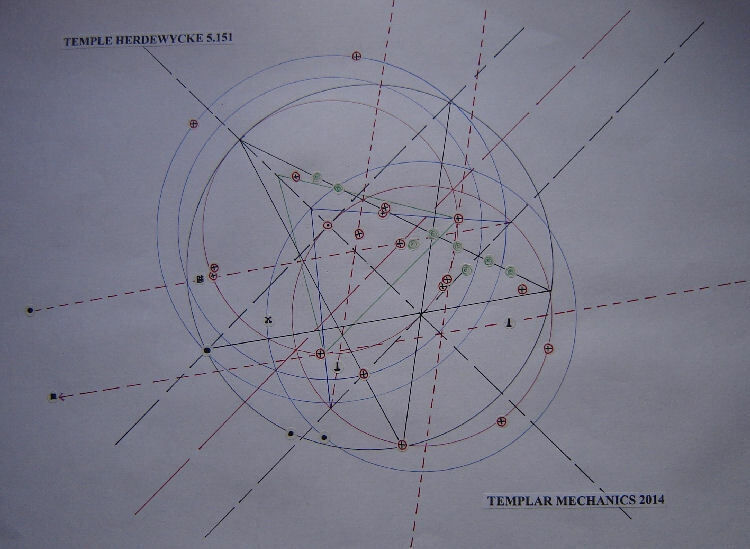 A perfect pentacle is formed within the system. This pentacle has its shoulder line passing through the 5.15 NW circle centre……The centre of the other 5.15 circle becomes the cross point of two pentacle lines marking the golden ratio division of both lines…a feature born of the mathematical majesty of pentacle dynamics……..perfect. One major pentacle line has 6 major hills along its length…Gaydon Hill, Windmill Hill, Halls hill, Fenny Compton Hill, Thornes Hill and Grenenton Hill. Other hills involved, Shooters hill, Church hill, Burton hills, Chesterton hill…and Christmas Hill, very fitting as I write this article over the Christmas holiday break of 2014 . Several major houses with parkland are involved…Upton, Ettington ,Bitham Hall and Westcote manor. The obelisk within Farnborough Park falls in as well as the obelisk near Edgehill. Site of the Edgehill battle of 1642 falls on the blue GP Earth / moon circle. Warwick castle’s main south entrance track /road sits on the main nw/se axis alignment along with Temple Herdewycke, St Runthald’s well and Rainsborough shown on the map as ancient Earthwork/ hill fort. Ancient village site marked on map as Stoneton… falls on main SE 5.15 circle axis along with Shooters hill, Badbury earth work, Ratley and a motte and Bailey.
. The Bruer hamlet also has a small private airfield, the runway of which runs with a 6 pointed seal axis line. More on this grid to comment on, but for now will leave it open until after one of our ‘reccy’ missions in the physical ….Always fun and very serendipitous as spirit shows the way. Looking forward to the better weather, so we can get down there to take the pictures and explore the many interesting places/ points involved. Best to everyone in these changing times.